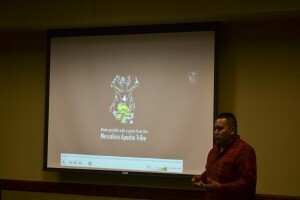 On the Black and Gold Screen: Filmmaker Pascal Enjady explains the context of the documentary he showed on Oct. 14 in CETES. The documentary, called “Two Year Promise,” documented the hardships of the Chiricahua Apache Prisoners of War. Cameron University hosted a showing of filmmaker Pascal Enjady’s documentary “Two Year Promise” at 9 a.m. on Oct. 14 in CETES. The film, sponsored by the Mescalero Apache Tribe of New Mexico, focused on the hardships of the Chiricahua Apache prisoners of war. This documentary has been a project about a year in the making for Enjady, who works with the Mescalero language program. Junior English major Rhiannon Poolaw brought Enjady to Cameron after meeting him at a powwow in Apache and talking with him about Native American culture, which was the subject of one of her directed writing projects. “When he announced that he would be showing his film while he was here, I could not pass up the opportunity to see the film and share it with other so I invited him to Cameron,” she said. After Enjady agreed to show the film at Cameron, Poolaw collaborated with members of Cameron’s English department and the English honors society Sigma Tau Delta to organize the showing. “Two Year Promise” elaborated on what Enjady felt was an overlooked part of history in which Chiricahua Apaches were imprisoned and mistreated by the United States Government in 1886. Enjady, a descendent of the Chiricahua, mentioned that he knew some of the history but learned much more after researching and filming the documentary. “I found out that there was more than had been written in books,” he said. Enjady said much of what he learned was as enlightening as it was grave. “The suffering is something that I have always known. Once I did this documentary, I learned more about families and individuals and all they had to suffer. It brought a new light to the issue,” he said. This new knowledge inspired Enjady to not only keep it alive, but to also enlighten the audience that not everything they would read and see is what seems. Poolaw made note that the message was not lost on the audience from what she could see. However, according to Poolaw, “Two Year Promise” followed in a line of documentaries important because of the knowledge, connection and thought-provocation it gives the audience. Enjady was thankful for the response he had as well as for the opportunity to elicit such a response.